00:50:00 Makes 4 servings, 1/4 recipe (290 g) each. Makes 4 servings, 1/4 recipe (290 g) each. The potatoes in this moist dish absorb extra flavour from being on the bottom. Microwave potatoes and water in 2.3-L microwaveable ovenproof casserole dish on HIGH 10 to 12 min. or until potatoes are tender. Let stand 5 min. Meanwhile, heat dressing in nonstick skillet on medium-high heat. Add meat and onions; stir. Cook 4 to 5 min. or until meat is done, stirring occasionally; stir in corn and tomatoes. Drain potatoes; return to dish. 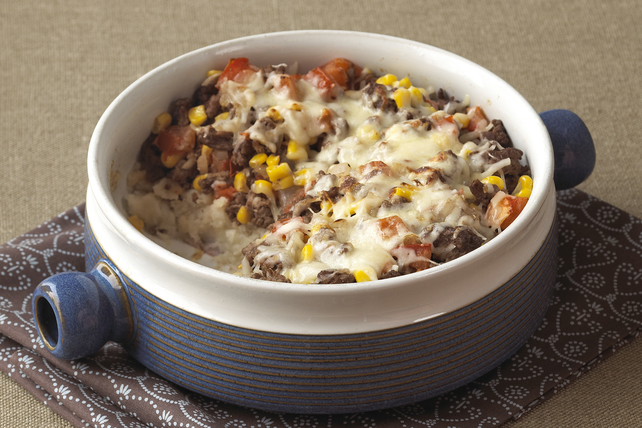 Flatten with bottom of small cup or bowl; top with meat mixture and cheese. Cover. Bake 25 min. or until casserole is heated through and top is golden brown, uncovering after 20 min. Don't have frozen corn? Use frozen peas instead. The potatoes in this tasty casserole provide an excellent source of vitamin C.
Serving Size Makes 4 servings, 1/4 recipe (290 g) each.